Most times a costume project involves a long planning process and careful thinking. 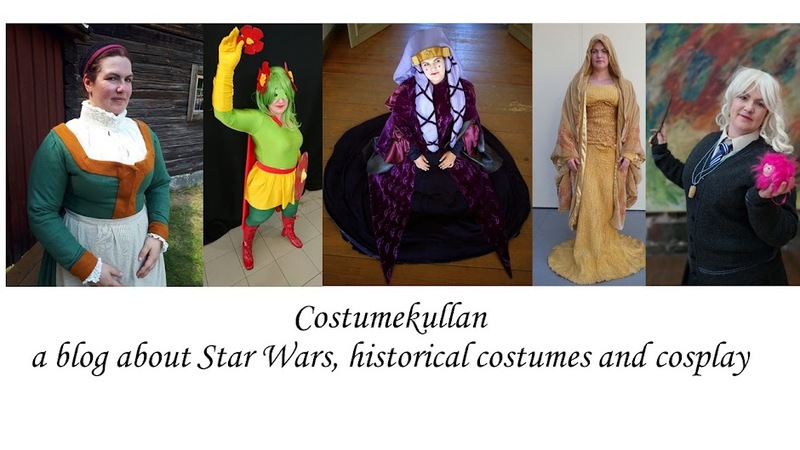 My latest costume came up as a sudden idea on Sunday, and now I'm planning to debut it at Avesta Con last weekend in October. I am a proud Ravenclaw and three years ago when I visited the Harry Potter studio tour I almost bought the official cardigan. Not because of me being a HP fan but because it looked good and I was on the hunt for a nice grey cardigan. I didn't buy it but spent two years regretting it. Last year my sister and nieces went to the studio tour and they bought the cardigan for me. 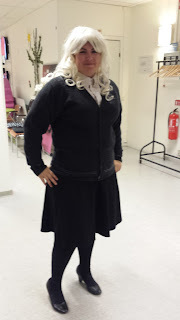 So I own the right cardigan, I then looked around and found my favorite wool skirt and a white shirt after my father and I realized that I already have most components of a Hogwarts uniform. I also have a blonde wig from my Elsa UFO. When I put all these things on I realized that I should have done Luna Lovegood years ago, and she's such a great character to cosplay. 4 asked my sister to help me make her braded dirigible plum earrings. I also need to find a pair of flat Mary Janes and learn how to tie a tie properly but I hopw that's not too hard.